The famous bouncing ball exercise. So you’ve heard of this animation exercise, and may have even tried it out yourself so what’s the big deal? Why is this animation test emphasized so much when learning animation, and are you really going to use the principles learned in that test elsewhere? 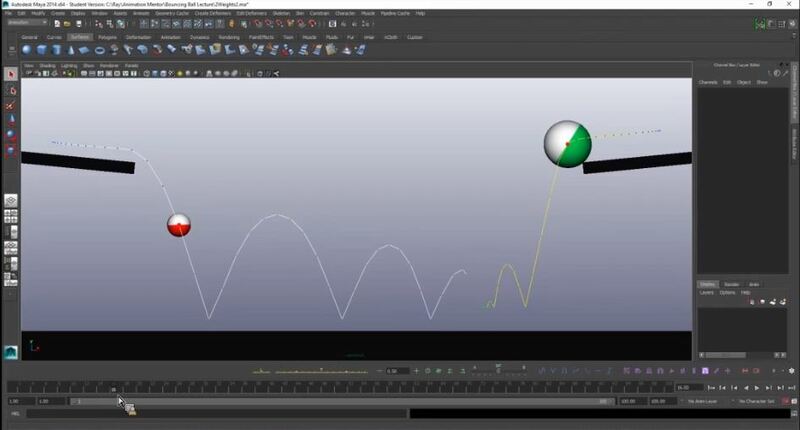 Read on and we’ll show you why the bouncing ball is so much more than just an introductory animation exercise. Why Should I Master the Bouncing Ball? As an animation exercise the bouncing ball may seem deceptively simple, but there are actually a lot of important principles in play within this test. In its simplest form it teaches you the basics of timing, spacing, weight, arcs, squash & stretch, appeal, etc. But like any aspiring animator we want to jump ahead to the “good stuff” like acting, emotional character animation, and awesome fight sequences. What happens when you go for the glory and ignore the fundamentals? A ball of frustration, things not looking right, and a great big hot mess. True to any art form, we have to learn to walk before we can run. You would be surprised to see how this simple exercise can be the foundation for the hips of a character, the head of a character, and the overall body of a character as we layer on more advanced principles. Even the pros at Disney Animation use a ball to block out some of their animation. The example below really highlights how the animator used a simple ball to block out his action sequence, timing, camera layout, and anticipation before he animates the character, so he can get a “feel” for the shot. Good timing and spacing is a critical component of this exercise. If either your timing or spacing is off just a little bit, it will break the illusion we’re trying to create. We want our bouncing ball to feel natural, have a good sense of weight, a nice recoil or springiness up from the ground, and clean arcs. Timing and spacing will be the building blocks to get those components to read. By spending the time to really master the body mechanics used in the bouncing ball exercise. You can layer more of the advanced principles and you’ll begin to see that with more complex characters whether it would be animals or humans, feel much more believable whether you are going for more of a cartoony or realistic style of animation. What’s important to remember is that you aren’t trying to recreate the realistic mathematical physics of the bouncing ball. Instead whether the ball is falling from the sky or rolling on the ground, you’re trying to capture the spirit and feeling of what a bouncing ball does. As animators we study our reference and observe the real world physics of objects in motion, but then we have to interpret that information and find a way to simplify it for the audience. 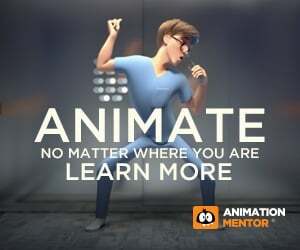 Many of our mentors here at Animation Mentor, along with veteran animators in the industry, will vouch for how important this exercise is and how the principles learned within it will stay with you throughout your entire career. You’ll Understand Good Arcs, Ease-In / Ease-Out, and More! 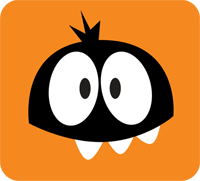 You may not realize it at first, but you’re really working with a lot of the core principles of animation within the bouncing ball exercise. As mentioned previously, every time you animate the bouncing ball you’re utilizing the principles of weight as well as timing and spacing. In addition to those principles you’ll also be learning how to create appealing arcs, how to effectively use ease-in and ease-out to refine your motions, how squash and stretch can help to sell the feeling of weight and impact, how good staging is critical so your audience can understand what’s happening on screen, and how overshoots can help add a final touch of polish to your work. Understanding how objects travel in arcs with weight differential. 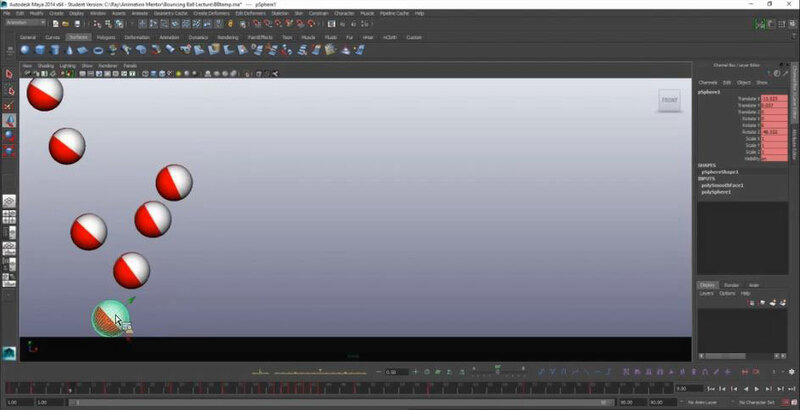 Demo of the principle of arcs in Maya 2016. This is where you can start to see how the bouncing ball exercise is a great animation test to keep coming back to. It’s simple to get started and execute the test, and there’s just so much to learn and keep improving on. Once you start getting the hang of how all these work principles work together, you can then implement them in more advanced situations. Again, you’re using these principles to help your characters feel more believable on screen. As you continue to animate you will have to work with characters and objects that are much more complicated than a simple ball. It can initially feel like quite a challenge to have all those parts of a character work together, but remember to take it one step at a time. As you get more and more comfortable with the building blocks used to animate the bouncing ball, remember to incorporate those into the rest of your animations. When you’re actually working on a more complex shot and feel as though you’ve hit a block, you can always recall what you’ve learned when animating the bouncing ball. Imagine a scenario you may encounter in the future where you along with your colleagues are called on by your director to animate a shot for the next possible mega hit. The director makes it clear that in the shot, the main character will be walking down a series of stairs. The problem is, is that the director would like to see rough blocking later that afternoon. How do you meet this deadline and still have something solid to show? Remember the basic principles you’ve learned and use the bouncing ball as your building block to approach this shot methodically. Get a nice appealing pose on your character, animate the hips as if they were bouncing down the stairs, animate the feet so they’re moving with the hips (and helping to catch that weight), refine and present! 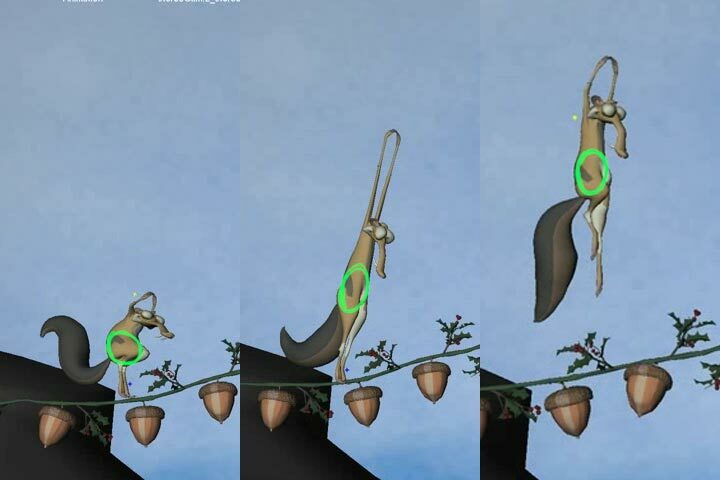 Most times you can find the motions of the bouncing ball in the character’s hips as they move, although not as exaggerated. Essentially, you’ll want to capture the basic pattern of ball movement within the hips. The rest of the lower extremities should then follow the movement of the hips while the character completes the main motion. We quickly touched on the principles of arcs – so if we were to track the arcs of the hips in this case, the trajectory looks like that of the bouncing ball! So whether you have a character jumping off a cliff or falling from a building, the same techniques of the bouncing ball can be applied to these more complex scenes. That’s right! Start making mistakes and remember to let loose and have some fun. Believe it or not, professional animators make a TON of mistakes and understand the value that comes from learning through those mistakes. How you react to your mistakes will make the biggest difference which then reflects in the work you’ll be putting out into the world. Don’t get hung up on what you think is “cool”. Instead, keep it simple and do your best. There’s no reason to over complicate any of these exercises. Start with the basics and slowly move your way up. Your future self with thank you for this. At the end of the day remember that your job is to entertain and touch the audience on an emotional level. Have fun and be joyful in the work you produce! You’re at the forefront of pushing the limits of art and filmmaking and just do your best to showcase what you can contribute. It’s our hope you understand how something seemingly as simple as a ball suddenly has just about all the principles of animation wrapped into one. And for this reason the bouncing ball is the foundation for all animations. Now go on and try it! 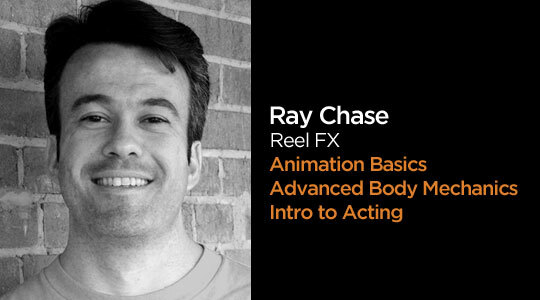 Learn to animate the bouncing ball with mentors like Ray Chase! Ray Chase is a 20 year animation veteran. You can see some of his work in The Book of Life, Despicable Me: Minion Mayhem 3D (short film), Open Season 3, and for the upcoming 2017 Reel FX hit, Rock Dog. He’s currently teaching Animation Basics, the first class in our Character Animation Program. Yes, That’s what was my first lesson in motion graphics. ! !